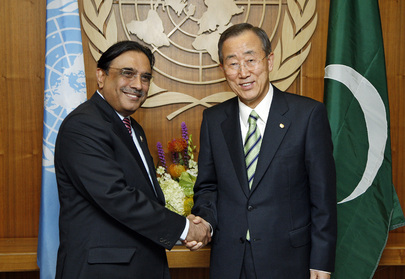 UNITED NATIONS, March 30 -- The release of a UN panel's report on the murder of Benazir Bhutto was stopped on Tuesday, based on a request from the President of Pakistan to UN Secretary General Ban Ki-moon. Ban's spokesman Martin Nesirky told the Press that the report will now be released on April 15. Inner City Press and others asked if the report would in the interim be shown to Pakistan, and if it could be changed before April 15. Video here, from Minute 11:15. Nesirky said, and his associate Farhan Haq later reiterated, that the report had not and will not be shown to Pakistan before April 15. But already there are quotes from "a U.N. official who has been briefed on the independent commission's report" that it faults the Pakistani "government for scrubbing down the crime scene after the killing." Inner City Press asked Nesirky if anyone in the Secretariat has seen the final or a draft of the report. "Pass," Nesirky said. "I don't know." Inner City Press asked if he would find out. He said he would "if the information is available to be publicly disclosed." Video here, from Minute 26:51. In these circumstances, of quotes from UN officials "briefed" about the report, and a refusal to answer which UN staff have seen or been briefed on the report, suspicious grow that the report will be changed, that such changes are the purpose of the 15 day delay. In the case of Sri Lanka, Ban allowed the protests of Sri Lanka to delay, and then give a seat to Sri Lanka's ambassador, in setting up a panel of experts to advise him about war crimes in Sri Lanka. In the case of Pakistan, even once a report was finished, Pakistan's president was able to get release delayed for two weeks, and no assurances have been given that the report will not be changed. This UN loses credibility daily, on these panels and reports, and also on elections, to which we will shortly turn. Watch this site. Inner City Press: Has anyone in the Secretariat, not just the Secretary-General, has anyone in the Secretariat seen either the final or draft report? And will you tell us between now and 15 April if anyone in the Secretariat, the Secretary-General or otherwise, sees the report? Is that something that you can, given the doubts that may come to exist about whether it was changed? Spokesperson Nesirky: If I am at liberty to tell you, then I will. Spokesperson: That’s called the moral maze. What I mean is, if I am told I am at liberty to tell you, then I will of course tell you. Do you understand what I mean? Inner City Press: I suppose so. But then, so then… So, on the 15th then we’ll ask you, did anyone see it, and then you will answer that? Spokesperson: Sure. Look, as you know, the commissioners have been working to put together the report, and they have worked extremely hard to put it together. They have worked with a team, and those people have been providing the technical assistance, if you like, to compile the report. Okay. Inner City Press: And the team are paid by the UN or are UN staff? Who is the team? Spokesperson: Pass. I don’t know. Inner City Press: Can you find…? Inner City Press: Staffed by the UN or DPA or no…? Spokesperson: As I said, the three commissioners, as you well know, they have travelled to the region; they have had support in doing so. Inner City Press: Right. But I just want to be like… is it, has there been any UN Secretariat staff involvement in staffing their work or arranging their travel? You see what I mean? It’s called independent, but who is actually doing the background for them? Spokesperson: The Commission is independent. 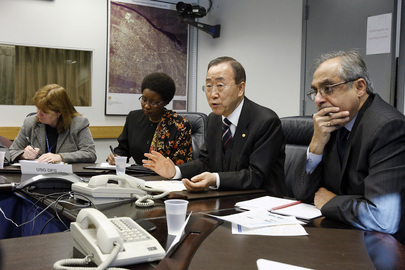 It was established by the Secretary-General, at his request. And the report is being provided to him. So, clearly, assistance will have been provided to help them to provide the report. The exact details, I don’t know the exact details. I am just telling you that they have been helped with the logistical support to compile the report. Inner City Press: [inaudible]… maybe, you may not know it right now. But has anyone -- just the same question that I asked -- has anyone in the Secretariat seen the final report ready to be delivered, or a draft of the report? Spokesperson: I don’t know that. Inner City Press: Will you commit to find that out or say if you can say it? Spokesperson: If the information is available to be publicly shared, then I will do so, okay? I think you understand what I can do and what I cannot do. I try to do my best, okay? Yes.